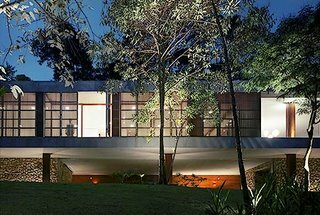 By the time a wealthy Rio couple hired architect Marcio Kogan and his associates to dream up a summer retreat for them, their house was already taking form. 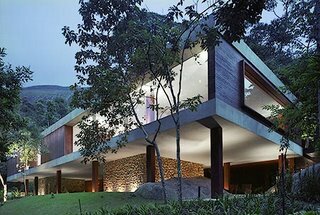 There’s a certain template that any right-minded architect would follow when building in the mountains north of Rio, where only rounded granite peaks interrupt the thick weave of rain forest. The landscape—rife with ferns and high, thin trunks—resembles Rio’s site when it was still wild and undeveloped. Part of the Atlantic Rain forest, this area rivals the Amazon in density and diversity of vegetation. Given the lushness and the privacy it affords, it’s best to let jungle be jungle: Build a terrarium in reverse—a viewing platform raised on stilts and nestled into the tree canopy’s green shadows. On top of these unspoken assumptions, Kogan had to contend with the partially completed work of a previous architect the client had fired: BR House’s steel skeleton already stood on a long, narrow strip of cleared and graded land, with a heavy steel entrance bridge leading over the creek that cuts through two edges of the secluded, 1.5-acre property. 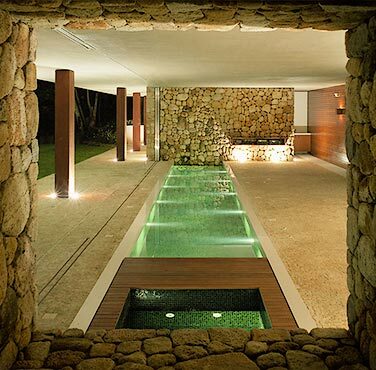 Kogan had no choice but to incorporate these elements. Much as the architect appreciated the site, he was not so pleased to see the building’s skeleton. Its steel pillars, raising the house above the jungle floor, lacked perfect symmetry in plan—a condition unsettling to his orderly instincts. But although constraints imposed by the existing structure dictated its overall form, the elongated box ended up suiting Kogan’s sensibilities. 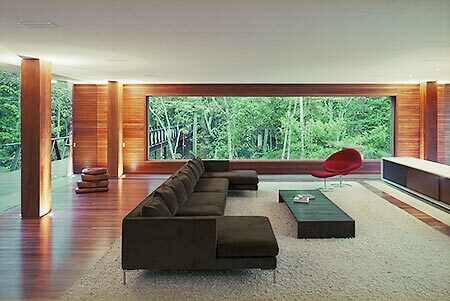 Brazilian Minimalists such as Kogan see no need to explain or excuse a simple box. But the team did expand this one, by 1,000 square feet, to 4,900 square feet. 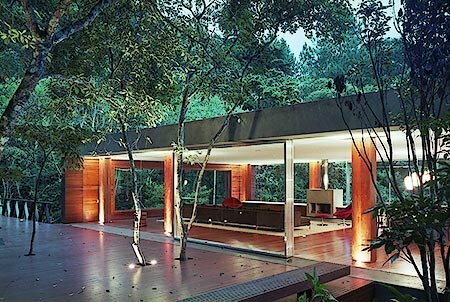 Where the original scheme would have brought the edges of the envelope only to the pillars, the adapted design cantilevers the main level’s floor and ceiling slabs several feet beyond the columns—diminishing their importance visually and turning a potentially inert treehouse-on-stilts into a seemingly weightless volume. Born in 1952. Graduated from Mackenzie School of Architecture in 1976. Received an IAB award for the Rubens Sverner Day-Care Center in 1983, and in 1994 an award for the facade for the Larmod Store, organized by the Magazine of the newspaper Folha and CCSP (Creation Club of São Paulo). Realized an exhibit of small-scale models entitled “Architecture and Humor”, a critical view of the architectural and urbanistic problems of the city of Sao Paulo, which had great repercussions throughout the city. Participated in the IV Architecture Biennial with these projects: UMA Store, Strumpf Residence and the MRA-2 commercial building in 1999. Awarded Architectural Record House 2004 for Du Plessis Residence – Laranjeiras / Paraty / Brazil.